Imagine a tiny droplet of water falling off a leaf….. How effortlessly the leaf of a plant lets that droplet slip away from its surface! Won’t it be BEAUTIFUL to just look at the things happening naturally ? I wonder if humans can also let go of the things which they tend to hold on in the same way, Effortlessly! THE MORE TIGHTLY WE CLING TO ANYTHING, THE MORE WE GET HURT. Be it a person, thing or money; you can’t hold anything for long because at the end of the day, life is dynamic and our stories come with a door….which act as an entry to some and exit to many. 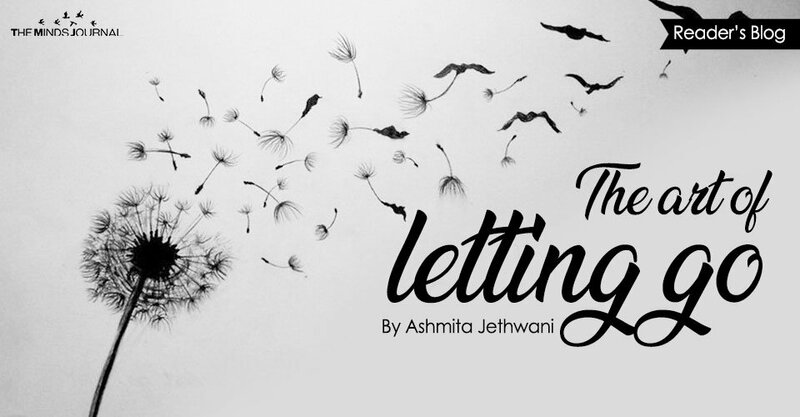 There is this metaphor that most people believe in ” YOU WON’T KNOW THE TRUE MEANING OF LETTING GO UNTIL YOU HAVE LOVED SOMEONE.” At some point of our lives we go through various situations that we thought, we were never ready for… that’s where our true life lessons begin and we began to create our own principles and belief systems. I know that you guys are familiar with this cycle of falling in love and falling out of it…it’s nothing new but the beauty of it is unexplainable. The beauty of BOTH falling in love as well as letting someone go is like meeting of the horizon. There is a time when two oppositely similar people cross each other’s paths like an intersection point. One is the sky & one is the earth and a thin line which is almost invisible between the sky and the earth, separates them forever…..and the promises of being together until death are somewhere faded along those lines. Both of them feel almost the same but are blinded by the selfish sadness of being hurt by the other. Well it’s not always the self-victimization that plays the main role but the battle of maintaining the self-respect in order to keep up the standards that we have created for ourselves. ITS NOBODY’S FAULT BUT THE GAME OF FATE. This fate once brought those two people together and the same fate separates them when their purpose in each other’s life is over. ” SOME PEOPLE COME IN OUR LIFE AS LESSONS.” is the perfect elaboration of the above situation. But what comes after those lessons is the major transformation of the self. At that point of life….most of us take a negative turn and shut ourselves down from the world….but some of us come out as a stronger person. It is not that the people who take a negative path continue to be on the same….the end of their roads also links to the same destiny of learning the lessons that they are meant to learn….. on their journey. Letting go does not mean to forget about the bad experiences that happened but to accept it and move forward. The best part of the process of letting go is FINDING YOURSELF. You discover yourself in a certain way which you were unaware of. No one could notice those things but you. But after it’s been found, it cannot be hidden from the world forever. It will exist as a different chapter in your story, which you will one day tell your grand children so that, they follow the same principles as yours.